In the world of international aid, microcredit is a rock star. The practice of giving very poor people very small loans to start very small businesses has been hailed as one of the very few unambiguous success stories in the long, frustrating fight against Third World poverty. The pioneer of the practice, Bangladesh’s Grameen Bank, has disbursed more than $8 billion in unsecured loans, usually in amounts under $100, to people traditional banks ignore. Along with a 98 percent repayment rate, Grameen has accrued an inspiring collection of stories about its overwhelmingly female borrowers, whose microloans allowed them to start up an embroidery or pottery business, or a snack cart or a stand selling cell phone cards, and through such petty entrepreneurship lift themselves out of poverty. “Small Loans, Big Gains,” a 2002 Globe editorial on microcredit was titled. Microlending institutions have sprung up all over the developing world, from India to Bolivia to Serbia; by one estimate, over 150 million people worldwide have taken out a microloan. Government aid groups and NGOs have rushed to fund them, and so have Wall Street banks and hedge funds, enticed by the promise of an anti-poverty program that can do so much while paying for itself - and even turning a nice profit. Grameen Bank and its founder, Mohammad Yunus, were awarded the Nobel Peace Prize in 2006, and Yunus is fond of saying that, thanks to microcredit, his grandchildren will have to go to museums to know what poverty looks like. But two new research papers suggest that microcredit is not nearly the powerful tool it has been made out to be. The papers, by leading development economists affiliated with MIT’s Jameel Poverty Action Lab, have not yet been published, but they are already being called the most thorough, careful studies yet done on the topic. What they find is that, by most measures, microcredit does not offer a way out of poverty. It helps a few of the more entrepreneurial poor to start up businesses, and at the margins it may boost the profits of existing microenterprises, but that doesn’t translate into gains for the borrowers, as measured by indicators like income, spending, health, or education. In fact, most microcredit clients actually spend their borrowed money not on a business, but on household expenses, on paying off other debts or on a relatively big-ticket item like a TV or a daughter’s wedding. And while microcredit champions point to microloans as a tool for empowering women, the studies see no impact on gender roles, and find evidence that if any one group benefits more, it’s male entrepreneurs with existing businesses. In other words, Karlan and others argue, there’s a place for microcredit in the campaign to help the world’s poor, it’s just not a very big one. And in the global anti-poverty fight - where aid budgets and public attention are both limited, and the potential stakes measured in the trajectories of millions of lives - it’s vitally important to know what actually works, and what is simply hype. That’s all the more true with microcredit, where the interest rates are usually far higher than what we’re accustomed to in the developed world, and where there’s always the risk that poor borrowers, just like wealthier ones, may end up piling up debts they can’t repay. 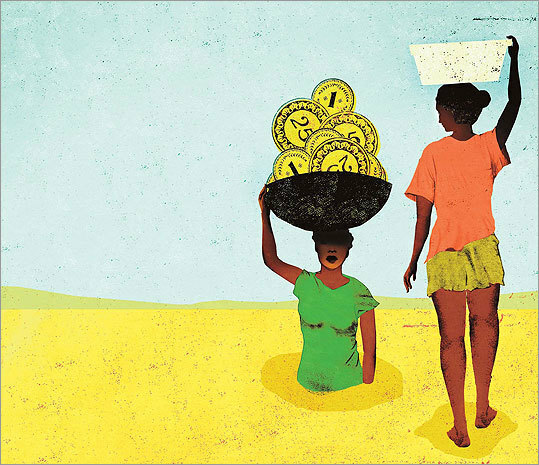 Microcredit’s defenders say the new findings, while suggestive, aren’t enough to prove anything. Some argue that they actually show that microcredit works, in a qualified way, providing a cheaper alternative to the village moneylender and his ruinous interest rates. Microcredit’s more dramatic effects, they suggest, may take longer to appear than the 1½-to-2-year windows the researchers looked at. Underlying all of this is a debate over the role and the importance of the micro-entrepreneur. Part of the appeal of microcredit lies in its suggestion that the world’s slums are populated not by helpless victims of global forces, but eager entrepreneurs lacking only a $30 loan to start a business and pull themselves out of poverty. The new research underlines the fact that, inspiring as that story may be, it misrepresents how both individuals and nations climb the economic ladder. Developing nations already have far more petty entrepreneurs than wealthy countries do, mostly because people there have little choice but to start their own business if they want to make any money. What these countries don’t have enough of are the kinds of steady jobs that more reliably raise incomes, and the sort of enterprises, often quite large, that provide them. Truly addressing the poverty of the developing world may require that we think macro rather than micro. In 1976, Muhammad Yunus was an American-trained economics professor at Bangladesh’s University of Chittagong. A brutal famine two years earlier had made him vividly aware of the precarious lives of the very poor, and he had begun to spend much of his time in Jobra, a village that abutted the university. It was there, he recounts in his autobiography, that he met a woman named Sufiya Begum, a young mother of three who made bamboo stools by hand. Begum was too poor to afford the 5 takas (about 22 cents) per stool that her bamboo cost, so she had to borrow the money from merchants. As part of the deal, she then had to sell the merchants her stools, and they set their prices so that she only cleared two cents a stool. All she needed to break out of that pernicious cycle, Yunus realized, was 22 cents. Then she could buy her own bamboo and sell her stools on the retail market, using what she earned to buy more bamboo and pocketing the profits. So Yunus decided to lend it to her himself. Working with a student, he drew up a list of 42 Jobra villagers in situations like Begum’s and lent them, out of his own pocket, the money it took to pay off their debts. All in all it came to $27. It was out of this first experiment that Grameen Bank was born; last month the bank disbursed just under $97 million worth of loans to borrowers all over Bangladesh. Yet, despite the explosive growth, there’s been little rigorous research on the efficacy of microcredit. This is not necessarily unusual for development and antipoverty interventions. Such research can be very difficult to do. When the target is something as complex as poverty, even at the level of a small village cause and effect can be maddeningly elusive. And once an aid organization or philanthropically minded corporation, won over by powerful success stories, commits to an antipoverty tool, whether it’s microcredit or bed nets or building rural schools, they tend to lose interest in funding research that could suggest that it doesn’t work. Ironically, the very speed with which microcredit has spread has made it hard to do the sort of comparisons that would most clearly measure its impact: in Bangladesh today it’s impossible to find a community where people don’t already have access to microcredit. The new microcredit studies set out to address these challenges. At least one author of each of the papers is affiliated with MIT’s Poverty Action Lab, a research center that brings together economists with a determinedly experimental bent. In particular, its researchers all share a belief in randomized controlled trials - the same sort of test that new drugs have to undergo - as a tool for evaluating poverty alleviation measures. Karlan and his co-author, Jonathan Zinman, an associate economics professor at Dartmouth, looked at a bank in the Philippines that offered microloans. They created their controlled experiment by altering the algorithm the bank used to evaluate creditworthiness so that some borderline applicants were randomly denied loans while other otherwise identical applicants had loans approved. The researchers then followed up with the borrowers and nonborrowers to see what difference the loan had made. The answer was not much. Neither household income nor spending rose for those who got microloans. And borrowers who did put the money into their businesses - instead of using it, as many did, for household expenses - actually shrank rather than grew their businesses. Karlan and Zinman suggest that this might be because the business owners were taking advantage of the loan to fire unproductive workers to whom they owed financial favors, and those firings seemed to explain the very small gains in profit Karlan and Zinman found. In addition, the gains accrued only to male entrepreneurs, not the women usually targeted by microcredit programs. The second study, co-authored by Abhijit Banerjee and Esther Duflo, economics professors at MIT, along with Rachel Glennerster, executive director of the Poverty Action Lab, and an MIT economics doctoral student named Cynthia Kinnan, found a slightly larger impact, though a selective one. Working with a microcredit bank in India that was looking to expand in the city of Hyderabad, the researchers did find some small positive effects. Borrowers who already had a business did see some increase in profit. Households without businesses that the researchers judged more predisposed to start one were found to cut back on spending, suggesting they were saving to augment their loan for a capital business expense like a pushcart or a sewing machine. The researchers also found small but encouraging shifts in household spending across the board, with less money spent on “temptation goods” like alcohol, tobacco, and gambling. Still, overall household spending - a key indicator of financial well-being - stayed about the same. And the researchers found no effect on children’s health or education levels, and the women in the borrower homes were no more likely to play a role in household decisions than those in the control group. To Duflo, this only seems disappointing because expectations for microcredit are so high. For microcredit’s defenders, evidence like this is, at best, an incomplete portrait. In part that’s because of the relatively short time horizon of the studies. “Certainly if people expected to see increasing incomes right away, in 12 months, that might be too much to expect,” says Nachiket Mor, an economist and president of India’s ICICI Foundation for Inclusive Growth. Other microcredit proponents argue that the fact that microcredit has proliferated as fast as it has, with new clients signing on in droves and old ones coming back repeatedly, means it must be providing a reliable benefit to borrowers, if only by allowing them to pay off higher-interest moneylender loans. “The fact that [microcredit] has survived commercially, I take that more seriously than any other piece of evidence,” says Tyler Cowen, an economics professor at George Mason University who has studied the topic. Even among some of microcredit’s more passionate proponents, however, there has been a ratcheting down of the rhetoric in recent years. What microcredit may do, they argue, is not transform lives, but simply ameliorate them, giving poor people a more affordable source for credit, and one that, unlike some moneylenders, will not resort to physical violence if someone can’t repay. “The picture that emerges is not of people climbing out of poverty through microenterprise, but people doing what they need to to get by,” says David Roodman, a microcredit expert at the Center for Global Development. Nonetheless, the microcredit narrative of entrepreneurship and self-advancement is a stirring one, and still tends to dominate the image microcredit institutions present to the world. Karlan sees the romance of this ideology standing in the way of measures that might more directly aid poor households. In many situations, he argues, the most helpful thing for poor households may not be a loan - especially since microloan interest rates can run from 30 up to 100 percent - but making it easier for them to save, or allowing them to buy some form of formal insurance policy against financial shocks. Research has shown that even people making $2 a day can put some money aside, and in many poor neighborhoods people don’t save as much as they might simply because there’s no trustworthy place to put their savings. And if there are interventions that can lift whole neighborhoods - and, ultimately, whole nations - out of poverty, they will probably have to be much broader in scope. Part of the appeal of microcredit is that it avoids the frustrations of anti-poverty campaigns that seek to catalyze economic growth at a large scale. But it’s a basic tenet of economics that scale has its advantages. Forty workers at a textile plant are going to be much more productive than 40 microentrepreneur weavers each working by themselves. Partly in response to these concerns, Grameen itself has begun to offer a line of loans of up to $10,000 for what might be called mini- rather than microenterprises. And in a more marked shift, a few NGOs have begun to focus on the previously neglected sector of medium-sized businesses in the developing world, looking not just at loans, but buying equity stakes in the companies to provide them with interest-free money. They’re bigger investments, and in the end they may have far bigger returns. Drake Bennett is the staff writer for Ideas. E-mail drbennett@globe.com .